Tea and Camphor Smoked Duck – an umptious duck dish involving curing, blanching, smoking with tea, steaming and then deep-frying. It has been quite long since I have blogged about tea recipes purely because I have not been cooking much lately. Yes I did bake some tea pâtisserie for the tea open house events but nothing complicated or experimental. As I prepared for my latest tea cookery theatre last week, I began to realise how much I have missed cooking with tea. I think many of us already know about the use of green tea in ice creams and in pâtisserie, not to mention various forms of cosmetics and toiletries. It is even used in the cat food I feed my 2 little boys (see picture)! And yes, my cats are also trained to do the tea ceremony! Now, the eating of tea was recorded as early as the Western Han dynasty (206BC) in Shennong Bencao Jing (The Divine Farmer’s Herb-Root Classic). Later classics talk about cooking tea, pickling tea, using tea as a salad, roasting tea and making tea congee usually with fresh tea leaves. In a high mountain organic tea farm I visited in China, I naughtily plucked and tasted a few fresh tender tea buds. They tasted very astringent when I first bit into them. However, I was not surprised to find that the astringency disappeared very quickly leaving only lots of umami sweetness and filling my palate full of beautiful floral aromas. My tea master Hooi says that chewing on fresh tea leaves is like eating posh sunflower seeds; it helps to stimulate the saliva producing glands and acts as an expectorant. Health benefits of eating tea aside, Chinese tea cuisine has 3 traditional characteristics: (1) It is delicate yet exquisite, (2) It mainly uses wild mountain vegetables together with spring harvest teas and (3) It embodies local cultures and tea culture. Tea has been used together with various Chinese cooking techniques. There are a few famous tea cuisine dishes such as Hang Zhou city’s Dragon Well Tea Shrimps (Long Jin Xia Ren) and Empress Dowager’s favourite Tea and Camphor Smoked Duck (Zhang Cha Ya) from Sze Chuan province and the ever popular street snack Tea Spiced Eggs (Cha Ye Dan). Tea and Camphor Smoked Duck is a rather complicated dish. It uses only autumn drake and undergoes curing, blanching, smoking, steaming and then deep-frying so it is strictly speaking not just a smoked dish. It is commonly served with Mantou (Chinese steamed fluffy buns). The meat is extremely moist and tender through the curing and steaming process. 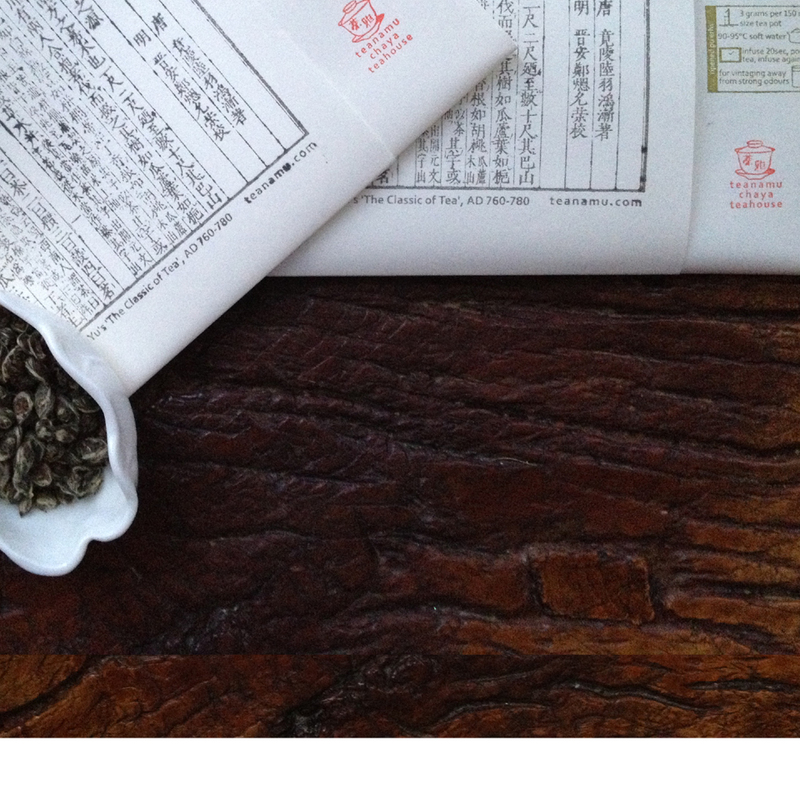 The skin, if done properly, is thin and crispy and full of the smoky flavours of the tea and camphor. The glutinous rice ferment is sweet and helps to create the caramelised glossiness when the duck is deep fried. I do not have a smoker so I use a large old wok and lid all covered with foil. 1) Blanching: Clean the duck and add to a pot with about 2liters of water, 10g Sze Chuan peppercorns, salt and pepper. Allow to soak for 4 hours. Remove the duck from the soaking liquid. Bring the liquid to a boil and quickly dip the duck into the boiling water for 5 minutes and strain. 2) Smoking: Prepare the smoker (or a large old wok covered in foil) by adding the pre-soaked wood chips, camphor chips, Wuyi Shuixian tea leaves, Sze Chuan peppercorns. As soon as the smoke has started, add the duck and smoke for 10minutes on each side. 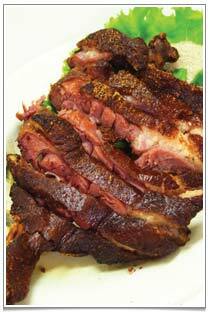 3) Marinating: Make the marinade from the Shaoxing wine, glutinous rice ferment, salt and pepper. Rub this marinade on the duck inside out. 4) Steaming: Steam the duck for about 2 hours. Checking to make sure that there is sufficient steaming liquid. The duck can then be kept for up to 3-4 days in the fridge at this stage. 5) Deep Frying: To serve, deep dry the duck till the skin is brown and crispy. Brush some sesame oil on the skin and serve hot with a Hoisin dipping sauce. I would prepare the duck up till the deep frying stage. At this stage, you can store the duck in the fridge or 3-4 days. The important thing is to deep fry the duck just before serving. That way, you will get the crispy skin that makes this dish so wonderful! Have eaten camphor smoked and tea smoked duck before my first try impresses me that really different from those braised or stewed typed. I am attract by the taste and cannot wait to another plate of smoked duck. Thank ! For the information. Yes this is a rather unusual dish and requires different cooking techniques. Thanks for visiting our blog!